Last Saturday the stallion inspection 2017 took place at the Sunrise Stables in Assen. Eight stallions had reported for presentation and judging, under the watchful eye of a large crowd. 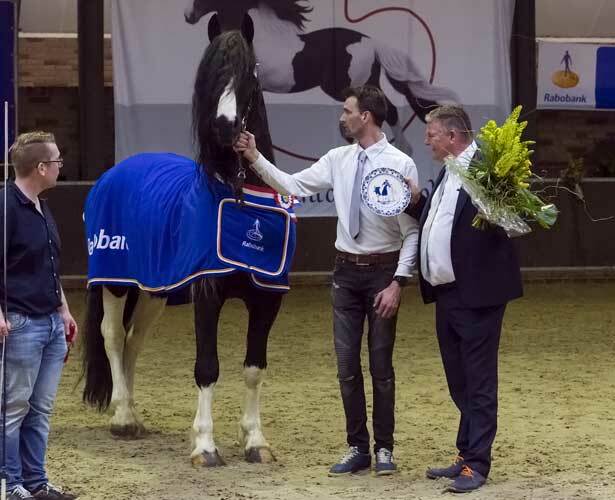 The crowd was both local and interational and the inspection could even be followed live through a Facebook livestream.These stallions showed great quality, according to head judge Gerrit Stelwagen. Noticable this year, was that many of the stallions are decendants of previously approved BPS studs. This shows a great future for the studbook. Out of the eight young stallions, 4 were approved, 3 were declared star with a breeding license and 1 was declared star without a breeding license. The fatherly appearance of the approved studs was large, a positive appeareance for the future of breeding! Previously appoved studs Bart BP07, Ricardo BP16 and Bob BP25 have also presented themselves during their mandatory presentation. Ricardo BP16, Bob BP25, Bouke and Bond then competed against each other for the day championship. This resuted in Bob BP25, bred and owned by Rinze van Teijen, becoming champion of the day! Bond, bred and owned by D.S. Vrieswijk, was chosen as the reserve champion. During the inspection, photographers Annie Damhof and Ralf Pospischil were present to take beautiful photos of all the horses. These photos can be viewed and ordered through link pictures and the facebookpage from Ralf! https://barockpintostudbook.com/wp-content/uploads/2017/04/Bob-BP25-daychampion.jpg 500 615 admin https://barockpintostudbook.com/wp-content/uploads/2017/11/BPS-home.png admin2017-04-06 20:23:252017-06-07 18:48:42Bob BP25 daychampion SS2017!